We’re committed to helping our clients achieve what might once have been considered impossible. Nowhere is this better demonstrated than our Innovation Series, the label we give to some of our most advanced and cutting edge technologies and equipment. The Innovation Series results from the collaborative approach we take with our clients to solving heavy transportation and lifting problems. If the ideal solution doesn’t exist, we will design it. Our world-beating R&D department works with teams around the world to find the best response to existing challenges; but more than that, they apply their wealth of experience and skills to anticipating future issues and designing a solution before it’s even needed. It’s this approach that’s behind remarkable feats of engineering: the award-winning AL.SK crane fleet with its record-breaking lifting capacity; the revolutionary Mega Jack system, which doubled the previous world-record lift; and the inventive Hydro Deck, a transition pontoon which can operate in almost all tidal conditions. What they all have in common is the solutions-focused design and real world expertise that makes them not only amazing engineering achievements, but powerful tools enabling our clients to work harder, smarter and more efficiently than ever before. The Mega Jack is an innovative and revolutionary ALE design engineered to push structures of staggering weights and sizes. The system’s capacity per tower with its four 1,300t hydraulic jacks is 5,200t, with multiple towers giving the jacking capacity required for the most challenging of projects. For example, a 10 tower system gives a net jacking capacity of 60,000t. The standard dimensions of the towers are 5m x 5m, 5m x 2.5m and 2.5m x 2.5m. This provides the system with enormous strength and stability. The strength of the design is its simplicity. The concept behind the system revolves around 4 strong jacking bases; within each jacking base is a hydraulic jack which could extend to a stroke of 1,250mm. By an automated feed-in system, the Mega Jack will jack loads to their required height. The system is controlled remotely via a control room, reducing worker/equipment interface and working at height, the system also produces real-time data for accurate readings at any stage of the operation. This safer working is paramount on any project. The control of the system is operated by computer from the special designed control room. All data including deck height, weight, ground settlement etc. is collected from one location. This provides substantial levels of safety for the operation. The Mega Jack 800 is an innovative solution designed by ALE’s renowned Research and Development team to bridge the gap in jacking capacities, as well as provide a system to integrate with current services for a complete solution on projects. ALE conceived the design through careful analysis of the current market and identifying areas for improvement in efficiency. The strength of its design is in its simplicity, the Mega Jack 800 has a capacity of 800t per tower, it is made up of a small number of components and is completely scalable to accommodate a variety of projects. The system can be built with minimal overhead space required and completely at ground level. For projects that require a multi-application solution the Mega Jack 800 can integrate with other services such as skidding systems to provide a complete solution and additional services such as bridge launching. For minimal on site disruption the automated feed-in system requires only one point of feed, this point can be on any side to adapt to restricted site space. After discussing potential projects that require heavy modules to be jacked-up in congested ports or sites with extremely tight space restrictions, ALE developed the Mega Jack series further to create the Mega Jack 300 system. With 300t capacity per tower and increased stability from multiple points, this system bridges the gap between conventional timber jacking and the Mega Jack 800. The feed-in is from one side to optimise space and is a suitable alternative to other, larger equipment. It is also designed to matcher trailer height for easy integration, so loads can be picked up directly from the trailers and onto the jacking system. Like the others in the series, with the ability for quick jacking operations, the Mega Jack 300 can complete jacking operations within one hour. 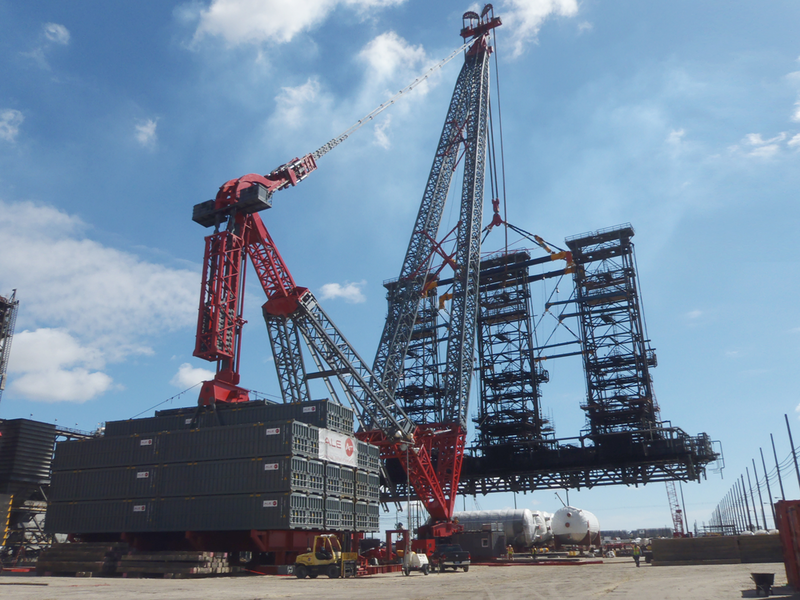 This system, which would have the capacity to jack-up heavy modules up to 10m high without bracing, has the same safety features, low-assembly height and quick jacking abilities of the Mega Jack 800 to provide a cost-effective solution, that is lightweight and compact enough to fit in a site with limited space. Because of its flexibility, it is easier to move or reconfigure on-site and ideally suited for work on oil and gas, port and civil projects globally..
Our AL.SK190 and AL.SK350 cranes are designed for the lifting and installation of ultra-heavy loads. They are equipped as standard with 2000-4000t main winch systems, plus a 600t capacity auxiliary winch system. The AL.SK190 – named to reflect the measurement of the load moment based around the point of rotation, which is the standard industry convention for measuring the lifting radius of cranes – has a lifting capacity of 4,300t, a maximum boom height of almost 200m, and a load moment of 196,000tm. It has two big advantages: it can perform lifts previously unachievable, and it can do this while occupying a very small footprint of just 35m x 55m. Due to the global demand for AL.SK cranes and the requirement for even greater capacity the AL.SK350, launched in 2013, has now taken its place as the largest capacity land based crane in the world by some distance. With a lifting capacity of 5,000t and a load moment of 354,000tm, this crane will enable the development of new and groundbreaking construction methodologies and save our clients time and money on the construction site by reducing schedule, risk and cost. The Hydro Deck is a mobile port solution designed to load and unload in tidal ranges up to 10 meters using a sophisticated ballasting system that facilitates 24/7 roll-on/roll-off operations for delivery of large equipment and project modules. It has revolutionised the delivery of modules for new large scale project developments worldwide. The Hydro Deck was conceptualised, designed and constructed by AG&P in partnership with ALE under Lloyd’s Register Class certification to the highest safety and quality standards. The Hydro Deck was built to serve global projects faced with different challenges, such as the restricted offloading delivery windows, due to unpredictable high tidal variations, and where local port facilities are limited by scale or capability for a project’s specifications. The Hydro Deck measures 140m x 40m x 12m, consists of a catamaran-type hull and has a deadweight of 32,000t. The pontoon uses an innovative water ballast and air tank system that enables buoyancy control in specific areas of the pontoon. Built in 2014, the Hydro Deck was initially designed for the delivery and staging of modules and brings a proven track record from its inaugural charter for the Ichthys Project. With unique tidal compensation capabilities and 100% redundancy in its ballasting systems, the Hydro Deck can dramatically improve the overall project delivery schedule as well as quayside and cargo vessel utilisation through optimised logistics. The Hydro Deck is available on a fully-serviced and wet-leased-basis with 24 x 7 operational availability. Such charter availability reduces project capital expenditure and protects the project’s schedule. The Hydro Deck is deployable worldwide and can be adapted to meet a wide range of project needs. In combination with ALE’s proven track record and drive for innovative solutions in heavy transportation and lifting, the possibilities of the Hydro Deck are unrivalled.